Please read the following information for nearby town descriptions and suggestions of things to see and do during your stay at TreeHouse Point! Fall City is a friendly community in the Snoqualmie Valley located approximately 2 miles from TreeHouse Point. Many are surprised to hear that we are not truly a city, but are simply an unincorporated rural town nestled along the banks of the Snoqualmie and Raging Rivers. Floating the Snoqualmie River is a popular summertime activity. No tube? No problem! Fall City Floating is a company that provides shuttle and rental services for everyone to be able to float the river. The shuttle ride upstream is included with the rental of the tube. Also included, is a complimentary locker to store valuables such as car keys. !Take Note! The floating company requires reservations on weekends and holidays. The Fall City Wallaby Ranch is a 10-acre privately owned property located in Fall City. The experience will begin with an educational introduction and photographic presentation, and answers to any questions about Wallabies and Marsupials. Then, there is an interactive time with the Wallaby or Joey. Guests are welcome to take photos of and with the babies and each guest will also be given a photo of one of the Wallabies as a souvenir. !Take Note! Please call prior to arriving to schedule your presentation time. Located only 5 minutes from TreeHouse Point, this adorable 1-acre lavender farm is not to be missed! Also, it is conveniently on the way to the famous Snoqualmie Falls & Salish Lodge. Come and celebrate when the lavender is in full bloom, mid-June through the end of September! Snoqualmie, located about 7 miles west of TreeHouse Point, is situated along the Snoqualmie River just above Snoqualmie Falls. The three forks of the river converge near the town to form Snoqualmie Falls, a spectacular 268-foot waterfall. Proximity to the gorgeous waterfall and to Snoqualmie pass made the community a popular stop for visitors, either by train or by road. Guests can board the train in a variety of locations; however, the closest location to TreeHouse Point is in the town of Snoqualmie (about 10-15 minutes away). Conveniently, guests may also return to the station from any stop, at any time. Round trip is approximately 1 hour and 45 minutes, including a stop at the Railway History Center. !Take Note! The train only runs on Saturdays and Sundays, April - October. Snoqualmie Falls is one of Washington state's most popular scenic attractions. At the falls, you will find a 2-acre park, a gift shop featuring many local artists, observation deck, the Salish Lodge, and the famous 268 foot waterfall. The distance between the free parking lot and the viewing platform is about 200 feet and is wheelchair accessible. Fun fact: these falls are taller than Niagara Falls, but not as wide. Founded in the year 2000, Down to Earth is a family-owned and operated florist and gift shop located in the heart of historic downtown Snoqualmie, Washington. The shop is a thoughtfully curated selection of gifts, cards and plants that continually rotates so you'll always find something new and unique. Fun fact: all fresh floral arrangements in the treehouses and lodge at TreeHouse Point are creatively arranged by Down to Earth. !Take Note! Closed on Sundays. Locally owned, this quaint little coffee shop is located right in the middle of Snoqualmie. Not only does Bindlestick serve one good cup of Joe, but they also serve delicious sandwiches, as well as beer and wine. In the summer, enjoy your beverage and meal outside in their sun-filled patio area! This gorgeous casino features eight restaurants, many lounges and bars, a large gaming floor and a world-class ballroom. Built in 2008, the Snoqualmie Casino has sweeping views of Mt. Si and the valley. Located 7 miles west of TreeHouse Point, Issaquah is surrounded by Cougar, Squak, and Tiger Mountain. Issaquah was originally developed to service the mining industry; however, as the mining deposits neared depletion in the late 1890s, lucrative lumber businesses emerged. These companies exported timber from Issaquah to Seattle and other larger, rapidly growing communities throughout western Washington for many years. It was not until much later that Boeing, Microsoft, and Costco significantly impacted Issaquah's economy. It all began in 1972 when Marvin and Ruth Mohl started saving unwanted buildings around the old farming and mining town of Issaquah. In saving the buildings, the idea was to honor the character and ambiance of the old community rather than to create a museum. They moved, renovated and combined them into an attractive retail area in a park-like setting with the ultimate goal of creating a haven for independent shops and restaurants. Over a quarter of century later, the 40-plus shops and restaurants that make up Gilman Village constitute one of Puget Sounds' most distinctive shopping destinations. Washington state has made drastic efforts to preserve the salmon and help increase their population by restoring the streams. Visitors of the Issaquah Salmon Hatchery can learn about the salmon life cycle and watershed stewardship with a host of interactive displays at the hatchery. Depending on the time of year, there are many different exhibits. Need some adrenaline? Paragliding from Poo Poo Point may be up your alley! The company, Seattle Paragliding is available for reserving tandem flights. With views of the Issaquah Valley, and Mt. Rainier on a clear day, this is a great way to enjoy a few daylight hours before returning to TreeHouse Point. !Take Note! Be certain to visit the website, below, for crucial details and scheduling. All flights must be booked in advance. From check-in to check-out, allocate 2 hours and 30 minutes of time. Boehm's Candies chocolate factory, known worldwide for its award-winning confections, has attracted thousands of visitors annually to Issaquah since 1942. The manicured grounds are graced with fountains, a replica of a 12th-century alpine chapel near Saint Moritz Switzerland, and the Edelweiss Swiss-style chalet which was the home of founder Julius Boehm. Guided tours are available by appointment, but stop by anytime during business hours to visit the gift shop. Located in the foothills of the Cascade Mountain Range, North Bend is located about 10 miles east of TreeHouse Point, situated in the upper valley of the Snoqualmie River. Native Americans resided in this area for thousands of years. By 1892, the town had a hotel, saloon, cobbler's shop, bank, and general store. North Bend received its name due to its location near the north bend of the South Fork of the Snoqualmie River. North Bend is home to a resident elk herd, numbering about 300-600 elk and was made famous by David Lynch's television series Twin Peaks in the early 1990's. Rent a kayak, stand up paddleboard, or canoe for a couple hours or for the whole day! All rentals can be picked up in North Bend or delivered to your location (Rattlesnake Lake, Snoqualmie River and surrounding areas). !Take Note! Please call if you need to set up delivery or if you are interested in multiple day rentals. Already out on the water and want to float a little longer? All rental times can be extended. 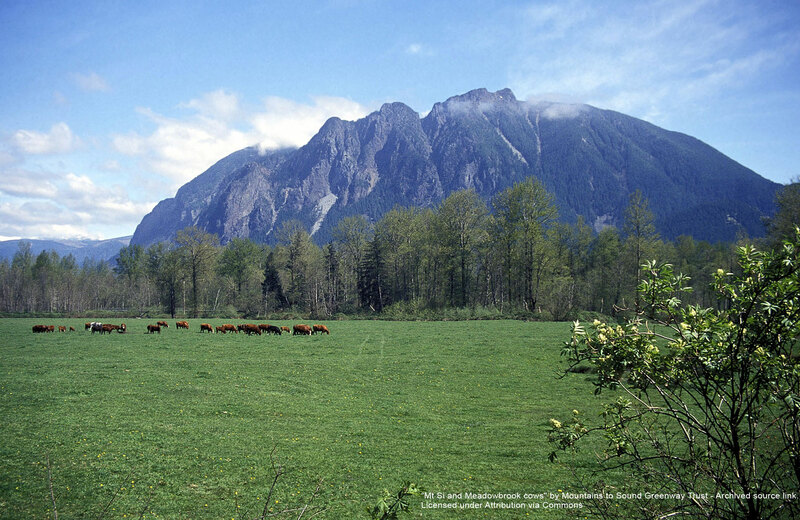 Framed by the majestic Mount Si, the North Bend Outlets offer discounted shopping with a view! Carnation, located about 8 miles north of TreeHouse Point, is a rural farming community situated along the Snoqualmie, originally known as the town of Tolt. The confluence of the Tolt and Snoqualmie rivers was the main village site for the Snoqualmie tribe for thousands of years. Dairy farming was an economic staple for the Carnation area ever since the brush had been cleared, but Carnation Dairy put the town on the map. In fact, the valley became world-famous as the "Home for Contented Cows." One cow from the herd, nicknamed "Possum Sweetheart," produced more than 37,000 pounds of milk in one year -- a world record. From the late 1800's through 1951 the town of Carnation switched its name back and forth a number of times, before finally settling on the town name of Carnation. There are almost 1,600 acres of market crops grown in the Snoqualmie Valley Agricultural Production District. Carnation area farms provide family activities and agricultural experiences. Many are available to the public! The Summit at Snoqualmie Ski Resort is just 20 minutes east of North Bend and features 2,000 acres of skiing with 25 ski lifts. Providing alpine skiing, snowboarding, and cross-country skiing, the Summit offers something for everyone! Don't ski or snowboard? The Summit also has the best winter tubing in Washington state! One session will include 2 hours of tubing! !Take Note! Purchase your tickets online in advance to avoid sold-out tubing sessions. Woodinville Wine Country is 40 minutes from TreeHouse Point, but it might as well be the other side of the world. This small, scenic valley is where the fruit of Eastern Washington meets the vintners, chefs and flavors of the Pacific Northwest. It's a delicious crossroads of winemaking, microbrewing, fine dining, and the people who pour their heart and soul into them. There are over 115 wineries to explore, experience and enjoy! Still looking for things to do? Visit this interactive map to explore the Snoqualmie Valley!